Over the past week I finished the satellite Yagi. I added a VHF Yagi and a band splitter to the UHF Yagi that I constructed first. Kent Britain, the designer of the antenna, wrote that you can obtain good results with a 2-element 145MHz antenna, but I decided to stay on the safe side with a 3-element antenna, like the one described by Richard Crow. I noticed that Crow’s 3-element antenna was a little different than Britain’s, and decided to build to Britain’s measurements. 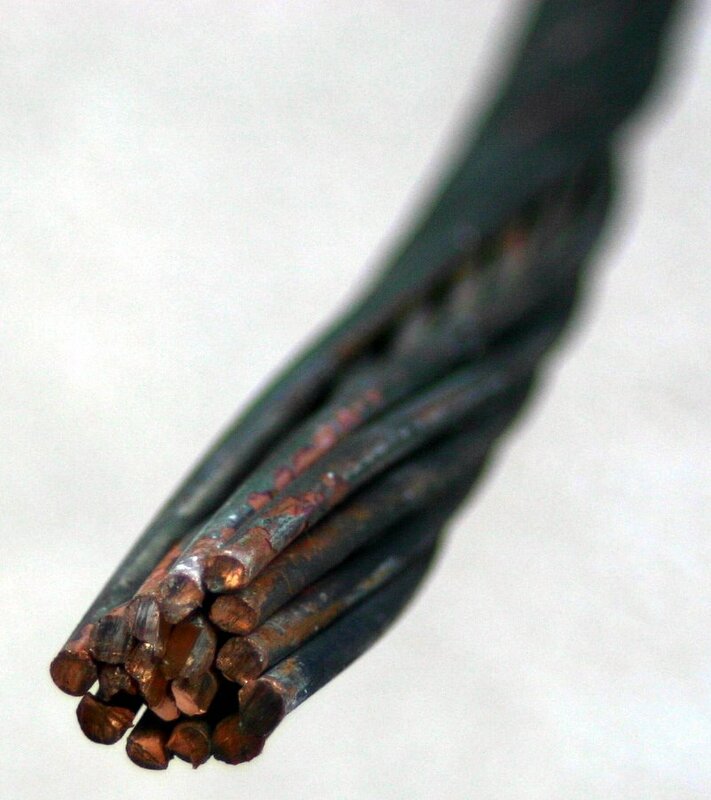 I first cut the elements out of the same stiff copper wire that I used for the 435MHz Yagi. I was not sure, however, how to combine the two antennas into a single structure. Britain suggested to mount the VHF antenna behind the UHF antenna, on the same boom and on the same plane. This makes it easy to transport and store the antenna, since it is flat, but the boom is pretty long. Crow mounts the antennas side by side; this is easy with his very lightweight construction, but would be harder with wood booms. Shamai Opfer suggested to mount them on separate booms connected by hinges, so I can store them together flat but flip them into a crossed configuration for operating. I eventually decided to start by mounting them one behind the other on the same boom, and to saw them apart later if I want to try a different configuration. I initially mounted the VHF Yagi 6 inches behind the UHF one, but when I re-read Kent’s article I realized that h wrote that they must be spaced only 3″ apart. So I removed the VHF elements, drilled new holes in the boom, and mounted them in the correct places. I soldered a connector to the VHF Yagi and verified that it was a good match to the transceiver. I was; no tweaking was necessary. I was also able to receive stations communicating using Morse code through VO-52, a satellite with a linear transponder whose downlink is on 145MHz. To communicate through satellites with the FT-857, I also needed a band splitter, a 3-port filter that would allow the single VHF/UHF connector of the radio to be connected to the two antennas (you don’t need it if you use separate UHF and VHF radios). Kent Britain’s article describes a simple splitter consisting of two 3-component filters, a high-pass for the UHF port and a low-pass for the VHF port. I did not have capacitors with the values in Britain’s article, so I designed my own splitter with Elsie, a filter design program. Elsie has an option to design diplexers, which are band splitters that aim to keep the impedance at one port constant over a large frequency range. 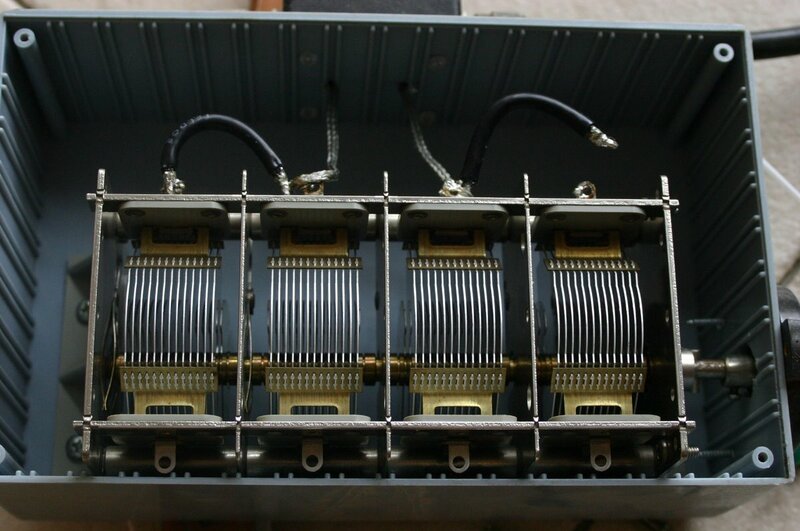 Diplexers are used following mixers, for example, where you want a proper termination for the image frequency and to various spurious frequencies that the mixer might output. 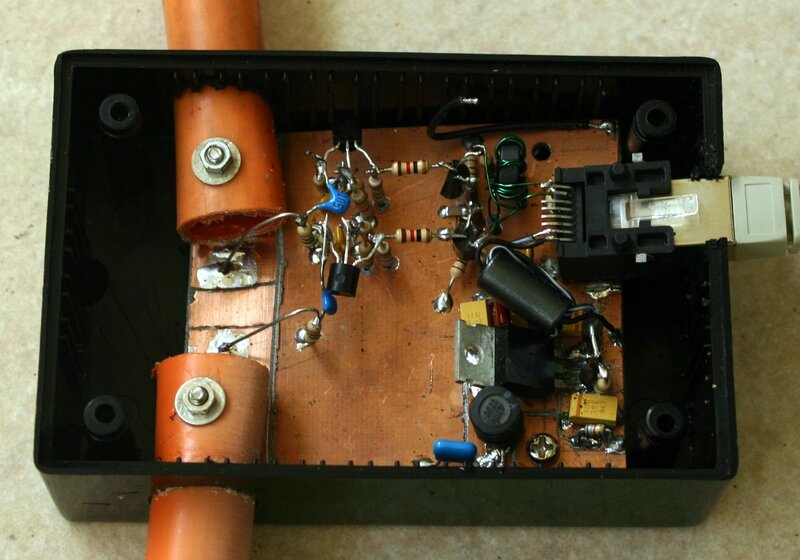 You can use a diplexer as a band splitter, but if you don’t need constant-impedance termination you have much more freedom to design the low-pass and high-pass filters. I designed the two filters by telling Elsie to design a Chebychev filter and playing with the cutoff frequency and ripple settings until I got the capacitor value I wanted in combination with very little attenuation at in the 145 and 435MHz bands. My capacitors were one 12pF cap for the 145MHz low-pass filter and two 5pF units for the 435MHz high-pass. This generated two inductor values. I then used Elsie inductor calculator to come up with appropriate air inductor designs. I played around a bit to get a sense of what inductance different diameters and turn counts gave. When I got close, I designed the actual filters by specifying the diameter and number of turns. For the UHF filter, I specified 3 turns and a 0.5cm diameter; a length of 0.9cm gave the proper inductance. For the VHF filter, I specified 6 turns and a 1cm diameter, which required a 1.9cm length. I wound the two VHF inductors from the same piece of wire and then bent it so that the inductors were at a 90° angle, to minimize coupling. The UHF inductor was mounted upright, also at a 90° angle from the VHF coils. The wire for all inductors came from a choke from a broken PC power supply. I connected the antennas and the radio to the splitter and tested the match. I was almost perfect on both UHF and VHF. I could open repeaters on both 145MHz and 435Mhz. I clamped the wooden boom to a camera tripod, as you can see in the picture at the top. The weight of the antenna is not balanced on the tripod. To relieve some of the force it applied to the tripod’s head, I tied the back of the boom to a leg of the tripod with a cord. It works, but I’ll need to find a better solution. The next step was to try the antenna on an FM-repeater satellite. Yesterday two of them passed overhead at reasonable hours, allowing me to try satellite communication for the first time. The first was AO-27, a very old satellite (launched in 1993). It’s web site specifies a schedule, which suggested that only its telemetry beacon would be active when it was over me. I tried to receive the UHF signal nonetheless. When it came over the horizon, I could hear the quieting in the receiver, but then heard a voice station calling. I replied and was able to work that station and 3 more. The next repeater sat to pass over was AO-51, whose repeater is active all the time, and which I was able to hear well when I only had the UHF antenna. AO-51 was much more crowded, with stations transmitting at the same time (and causing severe interference), but I was still able to work a few stations. Tracking the Doppler shift on FM is not hard; I’ll explain the issues in another post. I tracked the location of the satellites by manually rotating the tripod a couple of times during each pass. I am very pleased that the antenna allowed me to communicate through the satellites. The antenna is sitting in my balcony. As you can see in the picture, it is essentially indoors, facing a large window. There’s a ceiling above it; the walls around it and the ceiling are all reinforced concrete. From the balcony, about 120° of the sky is visible, towards the east and north. When satellites are to the west or south of me, I can’t see them at all. But in spite of all of these limitations, I was able to communicate through the sats. One of the reasons to buy the FT-857D transceiver was to experiment with satellite communications. There are many antennas that are suitable for satellite communications in UHF and VHF. 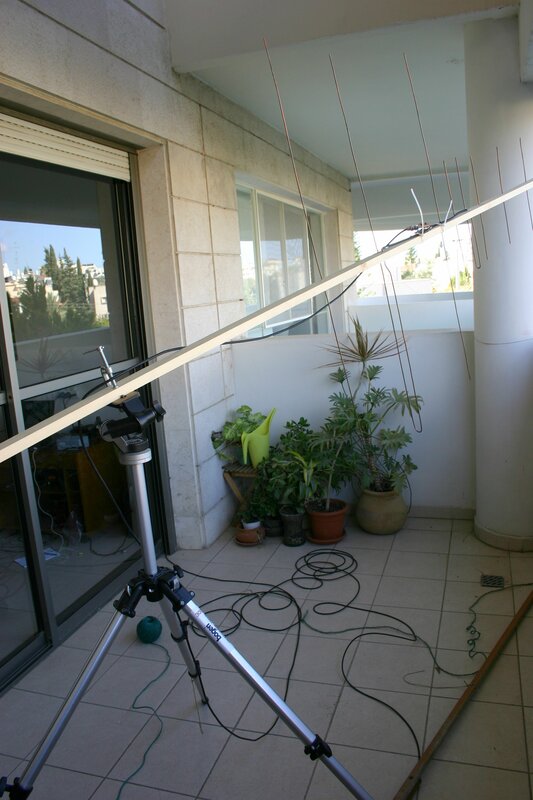 After investigating a bit I discovered articles on so-called cheap Yagi antennas that seemed easy to build. I started with the 435MHz Yagi, which is a little easier to build than the 144MHz version. The antennas were designed by Kent Britain starting in 1994. Kent’s web site contains one document with designs for the satellite bands and another with construction data for other bands. Kent suggest to build the boom from wood, which is what I did. For the elements I used stiff copper wire that I salvaged from a piece of power line that the local utility discarded when they replaced a power pole near my home. At least for the 435Mhz elements, which are about 35cm long, it is stiff enough. The boom is made of a 240cm piece of 18mm-by-36mm lumber. 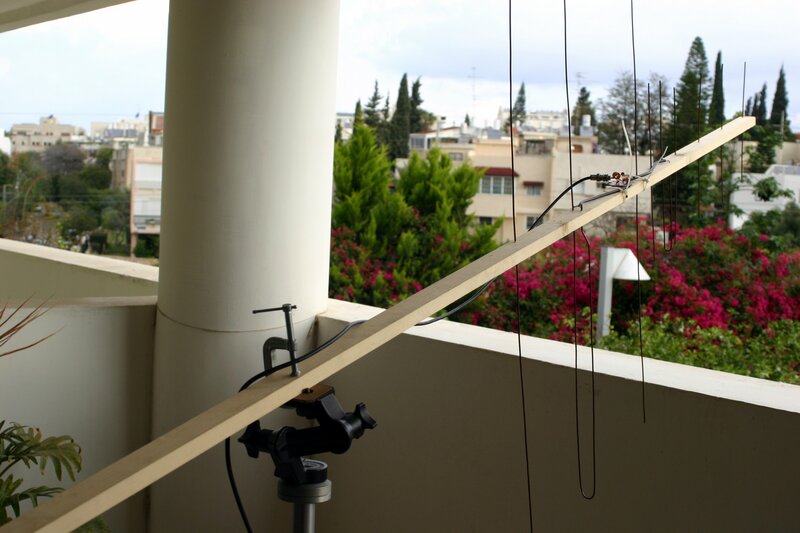 The 6-element Yagi I built does not use the entire 240cm length, only about 75cm. I drilled the holes for the elements with a hand drill. 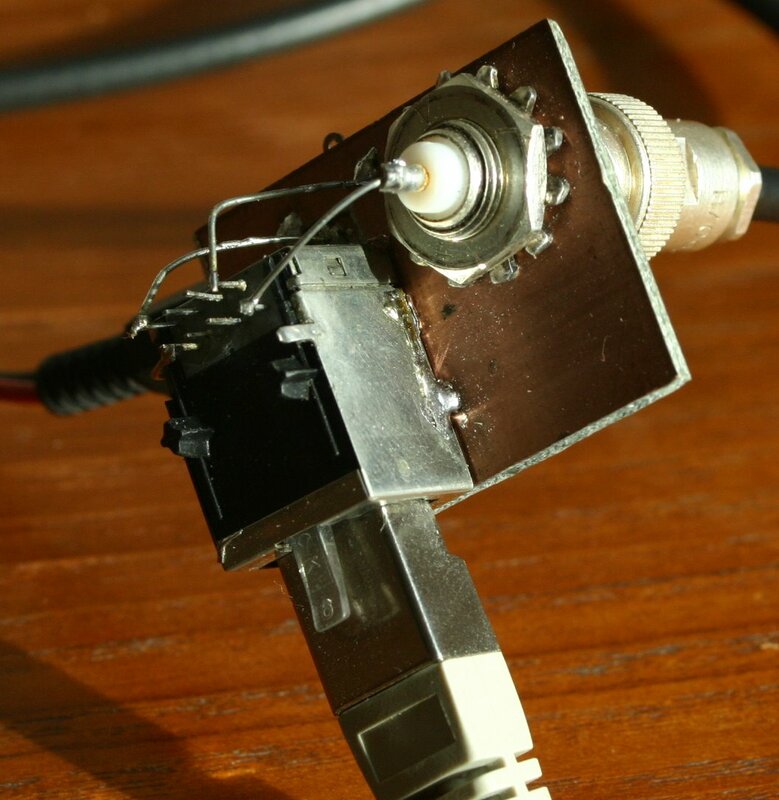 Three articles by Richard Crow on the AMSAT web site shows how to build satellite UHF and VHF Yagis with a boom made of a lamination of foam board. For some people they might be easier to build than the wood-boom Yagis, and they are lighter. I found that constructing the wood boom with hand tools very easy; I think that cutting and laminating foam boards would have taken me more time. The antenna was as easy to build as Kent claims. I just built the antenna according to the measurements in his article (Crow gives the same dimensions except for the separation in the driven element, which Kent wrote to me is not critical). I then soldered the coax and tested. The antenna had low SWR without any tuning. On the right you can see the discarded power line I used for the elements and the connection of the feed line to the driven element. After I finished building the antenna, I tried to receive a signal from a couple of satellites, but I heard nothing. The satellites I tried to receive were operational according to the AMSAT web site (click on Sat Status), they were overhead according to the satellite tracking module of Ham Radio Deluxe, but even when the receiver was tuned to the correct frequency and the antenna aimed in the general direction of the satellite, I could not detect any signal. I did not expect this to be easy, so I was not surprised at all. The next morning I tried again. Again I could not detect the first satellite I tried to receive, but the second attempt was successful; I was able to hear the Morse beacon of CO-58 very clearly. I was very happy. Experiencing the Doppler shift for the first time was really interesting. To actually communicate using satellites, I’ll also need a 144Mhz antenna. Richard Crow’s construction articles show how to mount the two Yagis side by side on a camera tripod. The configuration is the same as when two Yagis are mounted on azimuth-elevation rotators. It works on a tripod because Crow’s Yagis are very light; I am not sure that this setup will work well with wooden booms. 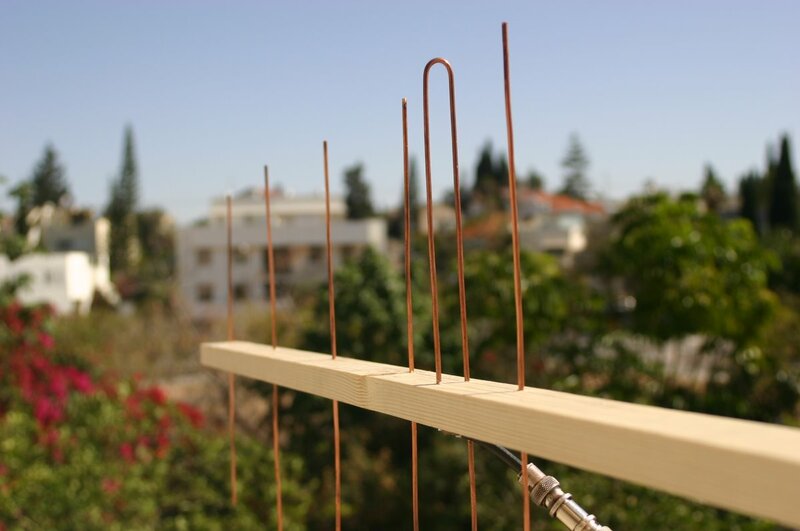 Kent Britain’s article shows a 5-element 435MHz Yagi and a 2-element 144MHz Yagi on the same boom, one behind the other. This is more convenient, but would be a bit awkward with longer antennas. The Arrow II antenna puts the two Yagis on the same length of boom, one vertically and the other horizontally. This is more compact than putting them one behind the other, but it makes it hard to stow and transport the antenna. This is not an important concern if you keep it mounted outdoors, or if you take it apart when you stow it, but the cheap Yagis are not easy to take apart. I’ll have to ponder this issue for a while. 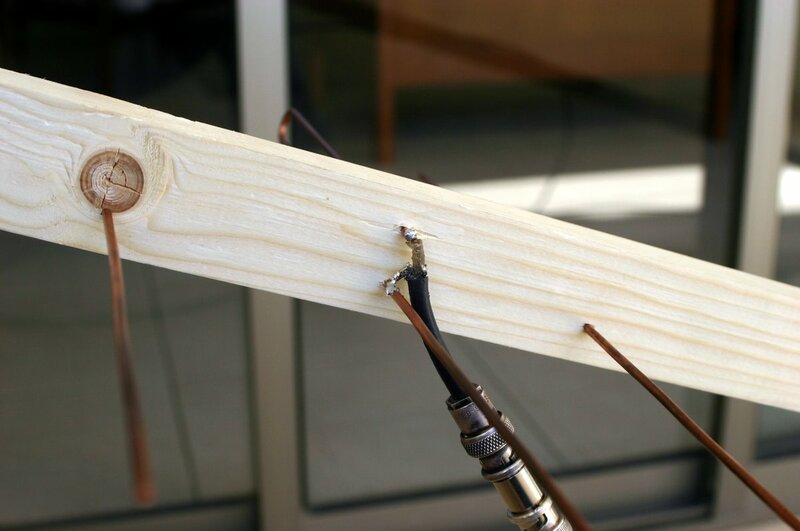 Satellite communication with a single transceiver also requires a band splitter; fortunately, Kent Britain’s article also shows how to build a simple band splitter; I’ll probably build it after I build the 144MHz Yagi. Ham Radio Deluxe (HRD) is a free program that servers as a user interface to radio transceivers. 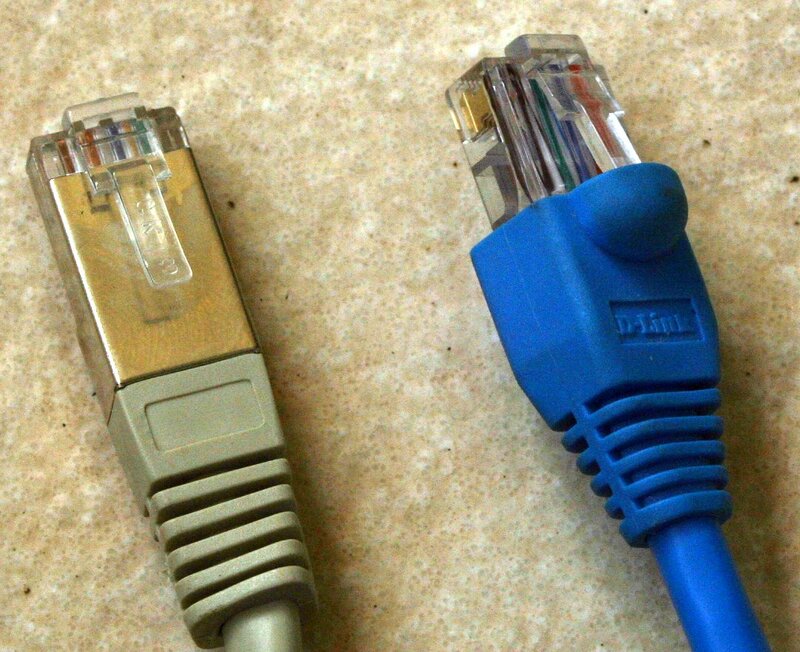 Modern transceivers can be controlled either from their front panel controls (if they have a front panel), or from a computer through a serial or USB connection. HRD allows you to connect to a radio, or even to a few simultaneously, and to control it through on-screen controls. Its user interface is absolutely fantastic. It comes bundled with a bunch of other radio-related programs, but in this post I am only interested in HRD itself. One cool and useful feature of HRD is that it can be used to control a remote radio. You run an HRD server program on the computer to which the radio is connected. You run HRD itself (the user-interface program) on another computer, and tell it that the radio is connected to the first computer. HRD establishes a network connection with the remote computer and controls it. Serial communication is not terribly complicated, so I thought that I might be able to reverse engineer the protocol and to write the Linux server code myself. I was right. I now have Linux code that HRD thinks is its remote server. It’s not finished yet, and I didn’t connect the radio yet to the Linux box, but this should be just a matter of time before it all works together. The rest of the post explains how I figured out the protocol. I’ll share the code itself once it’s actually working with a radio (if you’d like to help develop and test the code, please drop me a line). I initially assumed that the protocol would be pretty simple, and decided to figure it out using a Java program that I could configure either as a server, playing the role of a remote computer connected to a radio, or as a client, playing the role of the HRD GUI program. I would run the program as a server and try to connect to it from HRD. My code would dump the data it received, and this would tell me how HRD starts the exchange. I would then run it as a client, connecting to HRD’s own server, and send the data I received previously. The real server would respond, and now I would know what the first response looks like. I did this, repeating the process for 3 different request-reply exchanges. The messages were pretty simple, and I was able to determine where the fields were within the message and what they meant. For example, I discovered that messages start with a 4-byte length field, followed by a 4-byte fixed signature (HRD*), and so on. I did make a few mistakes (initially I thought that the length field was fixed, for example), and there might be fields that were always zero in my messages so I could not detect or understand them, but I discovered enough to make HRD happy with the connection process. The 4th message was much more complicated, and I realized that I would not be able to figure out how to parse it using this technique. I needed a more global view. 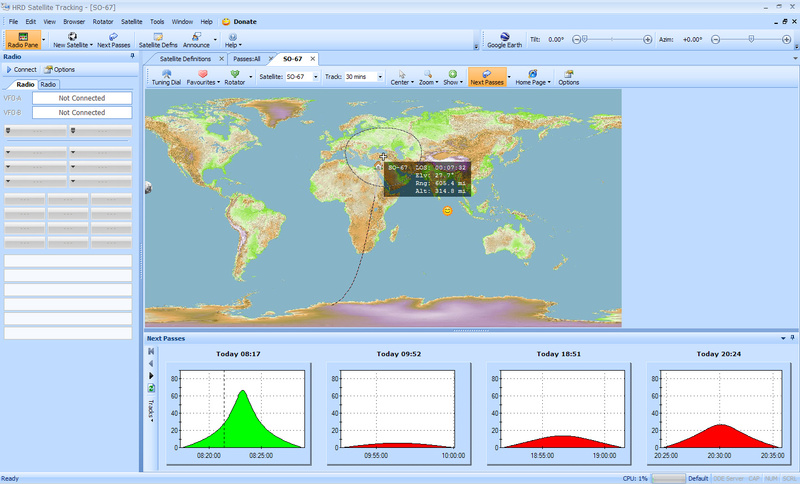 I obtained the global view using two free utilities, wireshark and portmon. Wireshark allows you to capture network packets. I used it to trace an entire connection between HRD running on one computer and its serial server running on another (Windows) computer connected to a radio. This made me realize that following the first 3 messages that establish the connection, there are a number of messages, all 520-bytes long, that probably configure the serial port. They were followed by serial read-write messages, and by a disconnection sequence. The 520-byte messages were all complicated, like the one I could not understand. 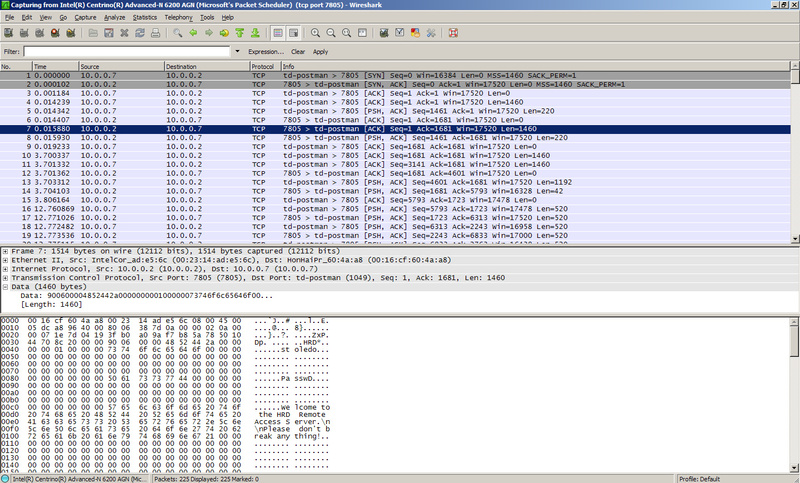 In the picture on the right you can see a screen shot of wireshark displaying this trace. I then switched to portmon, a utility that allows you to capture serial-port activity. In the screen shot on the right, you can see a trace of HRD connecting to a radio over a serial port. The important steps are at the top, where HRD configures the port; these steps correspond to the network messages I could not understand. I was still stumped for a while. The messages just looked too complicated, with random looking binary numbers all over. At some point, I realized that the fact that HRD configured the remote serial port using so many messages probably meant that it was basically just sending to the server exactly the same operating-system calls that it was making to configure a local port. In principle, HRD could have sent all the information required to configure the port in one message. The fact that it did not suggested that the protocol was designed to keep the server simple and to avoid duplication of code. I then studied the different system calls that Windows programs use to configure serial ports. This allowed me to reverse engineer enough of the protocol to make my server look like the original server to HRD. There are certainly details that I have not figured out yet, but I’m pretty sure I’ll be able to get my radio to run remotely when connected to a Linux box running my server. The final screen shot is of HRD displaying the welcome message from my server. The window at the back shows diagnostic messages that my server prints. That’s it for now. The current state of things are that the server code has been ported from Java to C (Java is not good for controlling serial ports), and that I still need to test it with the radio. Hopefully I’ll do that over the weekend. Stay tuned.